AN OPPRESSIVE FAMILY OF TYRANTS… AND A WARRIOR PRINCESS TO DESTROY THEM ALL. Princess and warrior Lynx of Norin is forced by treaty to marry Crown Prince Lukan Avanov. But Lukan is her conqueror, born and raised to lord over her. Lynx, his conquered, was born and raised to hate him. A royal command brings Lynx to Lukan’s palace for their first, explosive meeting. On a collision course of passion, they ignite a fire that will change them and their world forever. Destinies and lives are on the line. Who will survive and who will fall to the passion raging between them? 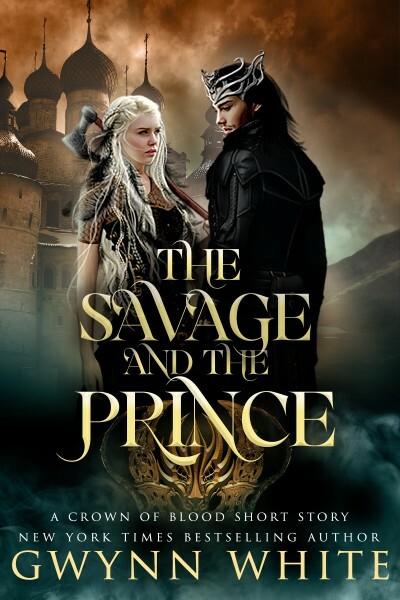 The Savage and the Prince is a short story prequel to New York Times bestselling author Gwynn White’s post-apocalyptic, fantasy adventure series, Crown of Blood.